While the Roaring Twenties is known for many things, the famous flappers of the 1920s are the decade's most beautiful and vivid. From the short dresses to the dance crazes of the era, flappers made their mark as the "New" Women of the modern world. She was known in the history books as, "Miss Jazz Age". 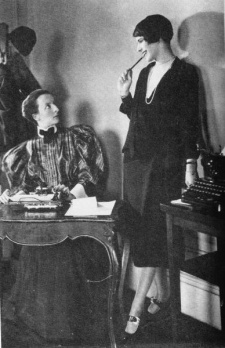 Lois Long made a reputation for herself in a man's business, the newspapers. Vibrant, witty and sharp with her finger on the pulse of New York city Long knew what was happening before it happened, often becoming part of the spectacle herself. Lois Long Started writing for The New Yorker Magazine in the early 1920s, after being lured away from Vanity Fair by the promise of $50 a week (a king's salary in those days, especially for a woman). In person, Long, known by the pen-name "Lipstick" Long, was the embodiment of the flapper girl, with her dark bobbed hair, her cigarettes, her whiskey, her flapper dress and her brash attitude. She said what she meant and pulled no punches to save peoples' feelings. She controlled her finances, destiny, and lifestyle. She drank, danced, and slept with whom she wanted in all corners of New York City. Lois Long was famous for returning to the New Yorker offices in the wee hours of the morning, drenched in booze and sweat, after a long night of drinking and dancing--stripping down into her slip, and hammering out her column that was due. Lipstick kept her finger on the pulse of what was happening with flappers of the 1920s, by being an integral part of the movement. She was beautiful, vivacious, and talented--she was true to herself. Lois Long went on to have a long , fruitful career at the New Yorker Magazine. She was the quintessential "New Woman" of the 1920s, embodying the personality and lifestyle of the flapper girl. Born August 19, 1899 as Kathleen Morrison. Moore was first cast in the "silent movies" in 1917's The Bad Boy. During her career she took on a few roles portraying flappers of the 1920s. Yet in person, Moore was quiet and subdued, perhaps even boring. . . preferring a self-described "plain" lifestyle. Despite her innocent looks and "plain" personality Colleen Moore became the "flapper queen" of Hollywood as a result of her role in the 1920s Flaming Youth a movie about the flappers of the 1920s. Moore cut off her distinctive curls into a bob and as a result, she became a superstar of the Silver Screen, making over $10,000 a week. F. Scott Fitzgerald wrote, "I was the spark that lit up Flaming Youth, Colleen Moore was the torch." Born in Toronto in 1893 under the name Gladys Louise Smith. At a young age she became known as "America's Sweetheart" as a result of her many stage and silver screen roles. She starred in 52 feature films in the early days of Hollywood, playing everything from a little girl to a flapper of the 1920s. In her personal life Pickford's relationship and marriage to Douglas Fairbanks helped create her career. "Little Mary", as she became known, helped create the cinema as we know it with films like Pollyanna, Sparrows, My Best Girl, and Coquette. Known simply as the "It Girl" of the 1920s. She was probably the single-most famous of the flappers of the 1920s, while only playing one on the screen. Clara Bow had "It" whatever it was. Beauty, magnetism, charm, cuteness, and dripping sexuality. She was born poor in Brooklyn. At an early age she attracted the attention of boys in the neighborhood. At 16 she won a beauty pageant and was discovered by Hollywood agents. Her mother, jealous of her looks and success, tried to stab her to death shortly thereafter. Clara Bow ran away. By 21 she had won the title of the "It" girl of the 1920s and starred in several movie roles. She became known as "The Hottest Jazz Baby in Films and her personal life matched her blazing onscreen personality.